I brought in my houseplants for winter last night. 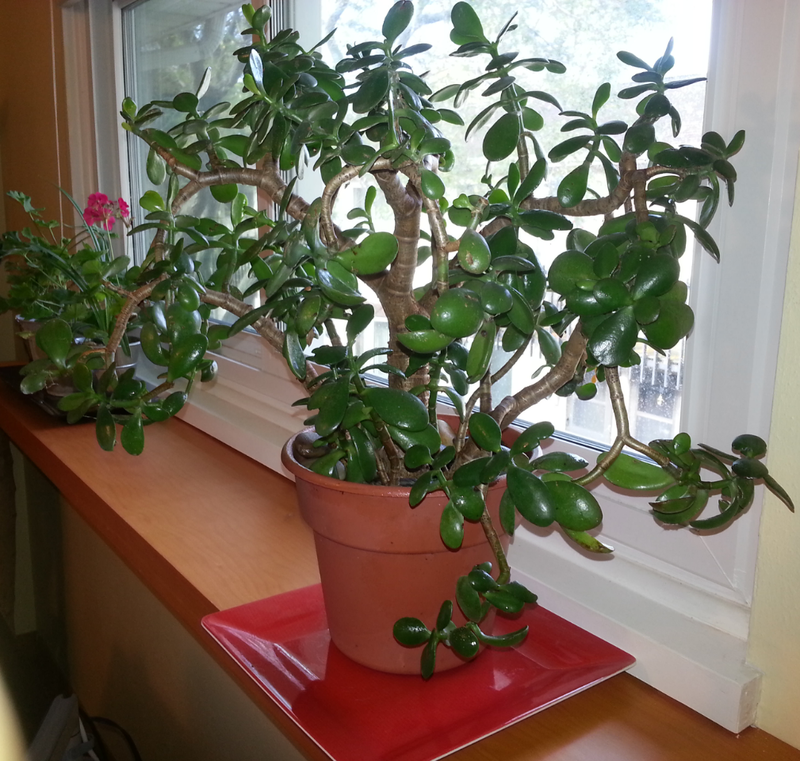 This jade is one I’ve had for several years; I started it from a cutting way back when, which is how I get most of my houseplants. What can I say? I like free stuff. But if you’ve been reading this blog, you’ve figured that out already. This year, I’ve decided to be methodical and spray down the leaves of all my houseplants with an alcohol solution (about 1 part rubbing alcohol to 3 parts water; I cheated and tossed in a little bit of clear rum from a bottle I keep around for times like these)* in hopes it will help prevent bug infestations this winter. The other thing I am doing is not bringing in my beloved variegated schefflera, which is basically beyond all hope as far as scale goes. It was a hand me down from an old office mate, so it has some sentimental value, but the sentimental value is not worth dealing with all the sticky secretions that the scale bugs leave all over the hardware floors. *The rum was free, of course, since I have absolutely no taste for hard liquor. I found it while browsing the refuse piles that apartment dwellers leave all around town in August when their leases expire and they clear out to make way for new renters. Come to think of it, that’s probably how I acquired the rubbing alcohol, too. I get most of my plant pots and plant saucers, including the ones above, the same way.